All-in-one kits are becoming very popular these days and there are probably several reasons for this trend. Firstly, they seem to be perfect for newcomers to vaping, because they are so easy to maintain and operate. As a back-up vape for more experienced users, pod systems are absolutely made for on the go vaping. They can be used much more easily in certain situations where stealthy vaping is called for, or else you simply don’t want to carry a big mod around. In this latest offering from Aspire, the system is based around the famous Aspire BVC coil head. This is the same one that is used in the Nautilus and Nautilus 2 tanks and has a reputation for delivering good reliable flavour. The AIO should appeal to all the many dedicated fans of those tanks. Slim and stylish, the Nautilus AIO comes in 6 popular colours, all with a satin finish. The whole thing feels very comfortable in the hand and is a little like holding a large flat marker pen. The Nautilus AIO is also small, measuring just 87.5mm tall, with a width of 37mm and 21mm depth. It easily fits into your hand and thanks to the flat design, it easily fits into your pocket too. In spite of this being marketed as a pod system, what Aspire have actually done is made a plastic refillable tank and just called it a pod. At first, the AIO seems a bit cheap and nasty, but the way that the pod locks in and releases via the two side buttons is very reassuring and the overall plastic feel of this pod system probably helps to keep the weight down. The whole device has been designed to be user friendly yet deliver the same awesome Nautilus experience. It utilises Aspire’s famous Nautilus BVC coils rated at 1.8 ohms and comes with one regular coil and a second one for use with nicotine salts. Aspire have built this system around the BVC coils and in fact the entire BVC coil acts as the device’s chimney. 3.8V or above – Blue and Orange light (Purple). The coil is easy to fit and the screw that holds it in place also becomes the adjustable airflow control, so you can set your draw to be as tight or as airy as you wish. Filling the tank can be quite messy however. It is filled by removing a plastic plug and then putting the nib of your e-liquid bottle into the hole, but I repeatedly found that air locks became an issue when filling. This sometimes caused me to spill juice over other parts of the tank, so you’ll still need a good supply of tissues handy. It would be very useful if you could fit the plastic cap on the base of the device while using it, but unfortunately it is a little too small. The flat AIO mouthpiece is very comfortable and because the coil sits high into the device and acts as its chimney, I feel that this closeness actually improves the flavour of the e-liquids I tried. The device put out a good amount of vapour and I found the 1000 mah battery performance was sufficient to last me for a day’s vaping in the office. Overall, I was really happy with the performance of this device. With the airflow fully open, I found that I could actually perform direct lung inhales. Keeping the airflow more closed down should be better for mouth to lung inhaling, so the AIO should suit all types of vapers. 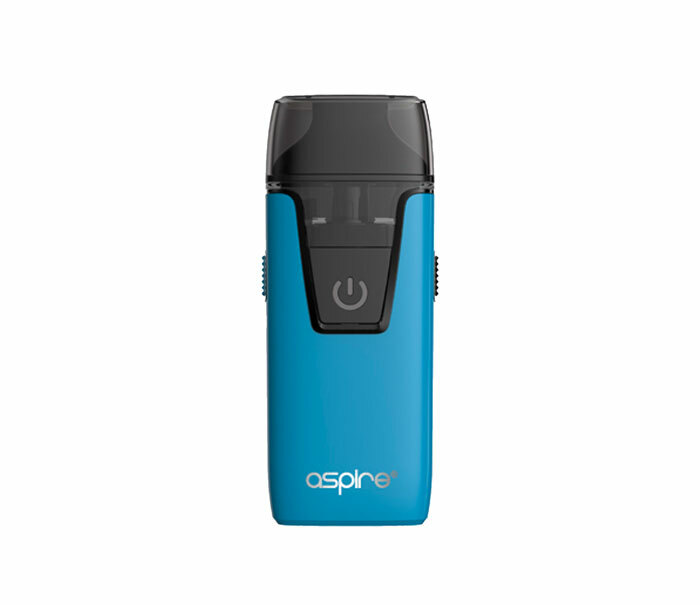 With such easy features and a good mouth to lung vape, the Aspire Nautilus AIO makes a great choice of e-cig to quit smoking with. If you’re just after a really easy to use compact and stealthy vape with a refillable tank and replacement coils, this could be the answer. Simple one button operation, with no other settings to worry about. Ergonomic shape to fit your palm of your hand. Sometimes difficult to see e-liquid level.